I'm running OpenBSD 3.7-RELEASE with GENERIC kernel. 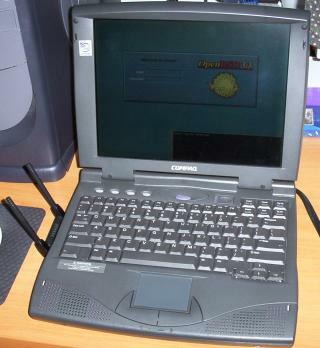 After the installation I tested a PRISM 2 WLAN based PCMCIA card and works perfectly with driver wi. X Window System Version 6.8.2 (X.org) works great 800x600 16 bpp (using old XF86Config, you don't need to rename the file). apm support tested and working (apm and zzz). Modem not tested at all. I'm using this Xmodmap at $HOME/.Xmodmap in order to add spanish stuff to the english keyboard. I had to use 'boot> machine memory +0x3000000@0x1000000' in order to use all the 64 megs of memory (OpenBSD detected only 16M). After installation I used /etc/boot.conf to fix that. Sound doesn't work (all it's detected, but seems it's not a SB compatible and pcm sound only does noise - cd audio works). Infrared port (pccom1) had conflict with soundcard (sb0) because of IRQ 5. After doing some changes with the BIOS, infrared works 100% with birda port (userland support for IrDA). The HDD access seems to be slower than 3.6-RELEASE, but I'm not sure. While installing ports the system it's very slow, may be it's related to changes in port management tools and the low memory of the laptop (only 64 MB). All seems to work OK (this snapshot is after 3.7 release, ie. my ural card works and not in 3.7 release). I'm going back to RELEASE branch soon, but next 3.8 release looks promising!